Cordova is a town that was started on a hope and a prayer. When gold, copper and coal were being discovered in Alaska in the 1800’s, an Eyak tribe live in a small village along Lake Eyak and Eyak River. By this time, European fishermen had discovered the fishing grounds of the natives and had set up fish camps and canneries. In 1900, the population of Eyak Village was 222; there were 70 natives, 99 non-natives and 55 Chinese. The need to move minerals from the interior to the coast where it could be loaded onto ships was the catalyst for a flurry of activity. Companies jockeyed to stake claims for railroad routes and deep water ports in Valdez, Katalla and Orca Inlet. Michael J. Heney surveyed a route down the Copper River to Orca Inlet and filed his claim to it in hopes of starting a railroad and then selling it to the mining companies. In Valdez George Hazelet staked a claim to land in hopes of a railroad terminating on his property. To hedge his bet, Hazelet also looked across the Prince William Sound to see what Heney was doing. Heney had set up his operations in the native village of Eyak by purchasing a fish cannery on the Odiak Slough which connected Lake Eyak to Orca Inlet. His employees needed housing and supplies so entrepreneurs quickly established businesses to cater to those needs. In speculation that Orca Inlet could become a terminus for a railroad, George Hazelet and 5 businessmen from Valdez formed the Cordova Townsite Company and laid claim to 143.65 acres of land just north of Eyak village in 1905. Those men were George Hazelet, AJ Adams, John Gooddell, Tom Donohoe, John Ostrander, and George Easterly. This area became known as the “Donohoe Homestead”. The Donohoe Homestead was surveyed and platted into a townsite by AJ Adams and recorded as the “Original Townsite”. In 1906, Heney bought into the investment company. The new townsite was named “Cordova” in reference to the name “Puerto Cordova” that Spanish explorer Salvador Fidalgo gave to Orca Inlet in 1790. However, Katalla was chosen to be the terminus and it looked like the men’s dream of a town was just a pipe dream. Nothing happened in Cordova for a couple of years but Heney continued building his railroad. Then, in the fall of 1907, a storm hit Katalla that washed out the breakwater. Guggenheim-Morgans bought Heney’s rights to the Copper River route and work to complete the building of the railroad to Cordova increased in 1908. Seizing the opportunity, the Cordova Townsite Company put their lots up for sale. The lots sold quickly and Cordova sprang up in no time as businesses in Eyak were dismantled and reassembled on First and Second Streets of the new town. Buildings were constructed with the anticipation of having telephones, electricity an indoor plumbing, which, in fact, happened within the first 2 years. Cordova became an incorporated city in 1909 and by 1910 the population was over 2400 people. After the railroad was complete, most of the men employed by Copper River & Northwest Railroad Company for construction work moved away and the population dropped to 1555 people in 1920. Between 1930 and 2013 the population has fluctuated between 1500 to 2500 people as year round residents and the summertime influx pushes the population up to about 5000. The railroad was shut down in 1938 after a workers strike and more railroad people moved away looking for work elsewhere. The Army came in World War II and started the railroad up again while an airfield was built at mile 13. The railroad track past the airport was pulled up and the rails were shipped out to be used elsewhere as steel was at a premium during the war. Later the remaining track between town and the airport was removed and the rail bed was converted to a road in the 1950’s. Cordova’s fishermen developed a strong market for salmon, halibut and razor clams that grew a foot long. Numerous canneries operated in Cordova and air transportation became the vital link between Cordova and the rest of the nation. Fishing became the mainstay industry. The incorporated city limits were expanded in 1972 when the City annexed the village of Eyak and again in 1993 with the annexation of 68.23 square miles around Cordova. As Cordova grew, her economy fluctuated as natural and manmade disasters struck throughout the century. The earthquake in 1964 damaged roads and bridges and raised the ocean floor thereby destroying the razor clam industry. Cannery fires destroyed valuable equipment, fishing boats and gear stored in warehouses. Numerous fires in the downtown area destroyed buildings and merchandise as well as homes. Severe storms and avalanches have left their impacts as well. The oil spill in 1989 destroyed the herring fisheries and disrupted the salmon industry. The effects of the oil spill continue to ripple through the community today. Throughout the century, Cordovans have displayed their fortitude by picking up the pieces and continuing to make Cordova a great place to live. Cordova is an eclectic community full of talented individuals with a rich cultural history. A visit to the Cordova Historical Museum or the Native Village of Eyak’s Ilanka Cultural Center will give you an introduction to both the Alaska Native history and cultures in the area as well as the railroad and early commercial fishing history found here in Cordova, the Copper River Delta and Prince William Sound. You will find the resources below in our business directory. 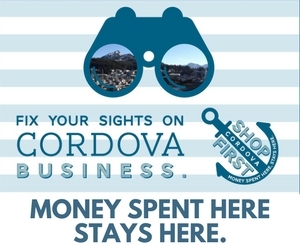 Cordova Chamber of Commerce is a non-profit organization serving the businesses and residents of beautiful Cordova, Alaska. Images courtesy Teal Barmore, Cindy Gibbons-Stimson, David Little and Chelsea Haisman. Cordova Chamber of Commerce © 2018 / All Rights Reserved.